Celebrate the 25th anniversary of the longest running musical of all-time on Blu-ray in February! In an early announcement to retailers, Universal Studios says 'The Phantom of the Opera: Live at the Royal Albert Hall' will have a Blu-ray release on February 7. 'The Phantom of the Opera at the Royal Albert Hall' stars Ramin Karimloo (2011 Olivier Award nominee for Best Actor in a Musical for “Love Never Dies”) as the lovestruck Phantom and Sierra Boggess (2011 Olivier Award nominee for Best Actress in a Musical for “Love Never Dies”) as the beautiful and gifted soprano Christine. The show also features Barry James, Gareth Snook, Liz Robertson and Wynne Evans, as well as special guest appearances from the actors who originated the roles of The Phantom and Christine, Tony® Award winner Michael Crawford and Sarah Brightman, in a memorable final curtain call. “Phantom” aficionados will also be thrilled to know that 'Love Never Dies,' Andrew Lloyd Webber’s spectacular follow-up musical will also arrive on Blu-rayTM and DVD for the first time on February 7. With lush visuals and a mesmerizing score that rivals the original in power and beauty, this live production of “Love Never Dies” finds Christine and the Phantom reunited in turn-of-the-century New York City after a decade apart. The Blu-rays will feature 1080p video, a DTS-HD Master Audio 5.1 soundtrack, and supplements include Getting Past the Point of No Return ('Phantom') and Behind-the-scenes featurette with Love Never Dies creator Andrew Lloyd Webber ('Love Never Dies'). 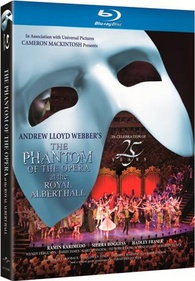 Suggested list price for the 'The Phantom of the Opera' is $39.98 while 'Love Never Dies' is $26.98. You can find the latest specs for 'The Phantom of the Opera: Live at the Royal Albert Hall' and 'Love Never Dies' linked from our Blu-ray Release Schedule, where they're indexed under February 7.